Sands China, run by Las Vegas tycoon Sheldon Adelson, has opened its new $4bn (£2.5bn) casino in Macau after a delay of almost one year. The opening comes as the firm has been its losing market share to new entrants such as Galaxy Entertainment. The resort, which boasts 1,800 hotel rooms and 240 gambling tables, was delayed due to a shortage of construction workers. Macau is the world's biggest gambling market. Investment house CLSA estimates that Sands will increase its slice of Macau's gambling market to 20% by the end of 2012, from 15% last year. The firm may also benefit from the the fact that no further casinos are likely to open for at least three years. Macau, a former Portuguese territory, is the only place in China where casinos are legal. It opened up the gambling market to foreign firms in 2002 and Sands was the first company to launch a Las Vegas-style casino in the territory. 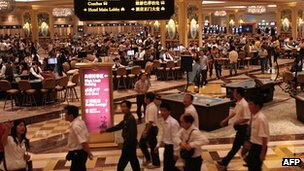 Macau's gambling market has witnessed tremendous growth since then and various new casinos have sprung up in a bid to cash in on the continuing boom. However, in 2010, the Macau government announced it would withhold approval of new projects and cap the number of gambling tables to slow the pace of growth. Analysts said this was a step in the right direction and will help the territory to sustain its growth. "Back in 2007 and 2008 you were seeing five to 10 casinos opening each year. That was definitely an unhealthy and overheating type of growth," said Richard Huang, an analyst at CLSA. "But the table cap policy seems to have worked and the Macau government seems to have got growth under control." At the opening of his new casino in Macau, Mr Adelson also spoke about his plan for a giant casino complex in Spain. "We are looking at 12 integrated resorts, 3,000 rooms each. A mini Las Vegas, about half the size of the Las Vegas strip in Spain for the European market," he said. A decision on where to site the casino is expected over the summer, with either Barcelona or Madrid expected to win the $35bn project.